Braemore Junction is the last time that the A832 meets the A835 on its way north to Ullapool. Whilst it is a simple T-junction, there is some interesting history in the site. On the opposite side of the A835 is a large car parking area on the former alignment of the A835. The road has been straightened by diverting the river futher south, as can be seen by the concrete walls along the edge of the channel, and indeed the slightly more jagged nature of the rocks under the new bridge on the A832. This route does not appear to have changed alignment significantly, although any evidence of the old bridge is now lost under the new embankment to meet the A835. Despite the room afforded by the parking area, there is no right turning lane provided on the A835, but as the road is only really busy around tyhe times of the ferry sailings, this is not a particularly big problem most of the time. 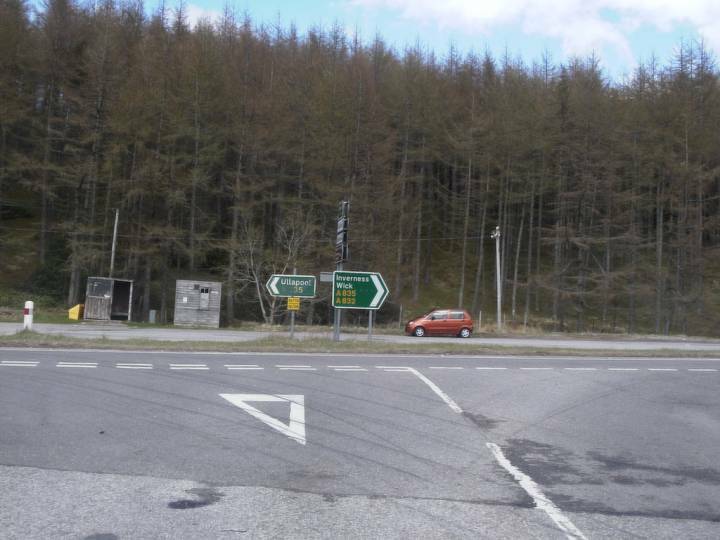 Sign facing the A832, as it was in April 2001. This page was last modified on 29 July 2018, at 21:35.